It’s one of those days… the weather is grey grey grey and rainy. You look outside the window and think to yourself, what am I actually doing on this earth. The sun doesn’t seem to want to come out and the world gives you the feeling as if it just wants to go back to sleep. Five Hours on Skype since the early wake with my most beloved person made it a little better but not being with him is ripping my heart apart a little more each and every day. Everytime I see his big smile it lights up my heart just as much as it hurts to not be able to kiss that silly face… and then there is this every burning question in the back of my head, what is the future gonna bring and future is rolling over me faster and faster. The first set of Exams is gonna be in March, the second and final Set is gonna be in May. I don’t feel prepared at all. There is still so much time but I feel like the last 3 years where a waste of time. I could have studied in the US, but no I decided to go back to Germany and get my Education here. How you always learn it from your parents, a good Education is Key. Only Question here is, where is my Education? Why was I the one having to teach my Boss, my supposed Mentor, how to use our Programms at Work. Why is the Chamber of Commerce who’s supposedly watching over us Students not helping when you call for help… So many Questions but I know I will never get an answer to that. Being the first Student with allmost straight A’s in my Company should have made me worry much earlier. Enough worrying for a moment, I need to change my thoughts into something happier. Apples. I remember those leftover Apples. Time to get out a cutting board and cutting away, bad spot here, core there, cut it out, throw it away, cut the good parts in cubes and put them in a bowl. Wow I realize I posted a lot of Apple stuff lately. I guess it’s Winter and thats kind of a Winter Fruit. Yeah that will do as an Explanation I guess. Oh darn, to many bad spots on the apple and not enough for an apple pie filling. Time to see what else is in the Pantry. Glad I remember this can of Peaches. Apple Peach Pie it is then. I cut those cute Peaches in cubes too. This is something to relax… but my mind wanders again while cutting, why do I always have this subject on my mind. I miss him so much. I miss the place where my Heart is at home. I have to think about how he always comes and hugs me and keeps me close. He doesn’t like when I am far away from him … I don’t like it either. I can feel his kisses and I wish … I wish…. Hmm enough cutting, adding some Sugar and plenty of Cinnamon plus 4 Tablespoons of Flour to the mixture. Mix mix mix away until the fruits are evenly coated with a layer of Sugar-Cinnamon-Flour-Goodness. 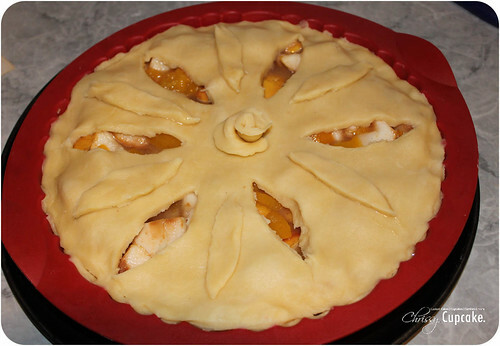 Pie Crust… how did that go again. Time to look it up, ahh easy but they use Shortening, I dont have that. Butter. I’m just gonna make my own Buttery Pie Crust. 3 Cups of Flour, 1 Cup Butter and 1 Cup of Water… argh my Butter is way to cold, time to use my fingers. It works wonders. When I got the butter worked in evenly I use about 5 tablespoons of ice cold water and work it into a pretty pliable dough. Make two pieces out of the dough. 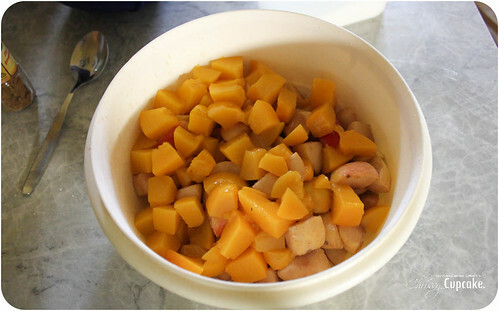 Roll out one part thinly, put into a Pie Dish, add the Filling, roll out the second part and put on top. Cut away edges and squeeze the top and bottom dough with your fingers to seal the edges. Cut some nice little Steamvents in the top. Put in the oven at 450Degress for about 30 to 45min, or until the Crust is nice and Goldenbrown and your apples are tender and delicious. I have to stop. I can’t. 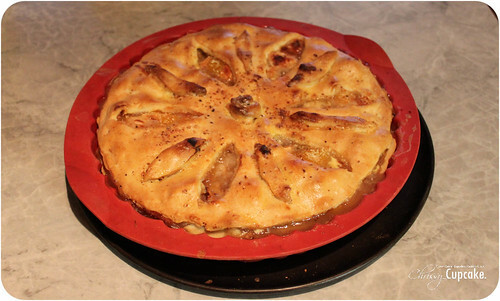 FINALLY… the apple pie is done. If you want it extra shiny, short before it’s done, take an egg, whip it and just brush it on top. It makes it look extra neat and delicious. It’s hot and steamy and it smells like Cinnamon, this is just what I need right now. It might not look to pretty… but after putting it on the table it was basically inhaled by my family… Hot, steamy, appely goodness. Sometimes there is no better comfort than this, even if its just for a little while. 1. 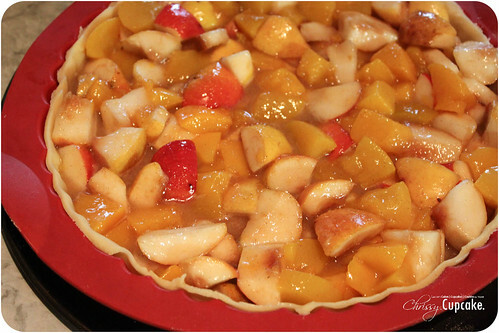 Mix the cut Apples and Peaches with the Sugar, Cinnamon and 4Tbsp of Flour. Set aside. 2. Mix the Butter with the Flour until it resembles the form of coarse Corn meal, add the water one tablespoon at a time, always adding the water to the dry parts, mix into a nice pliable Dough. 5. Roll out the second part and put on top. 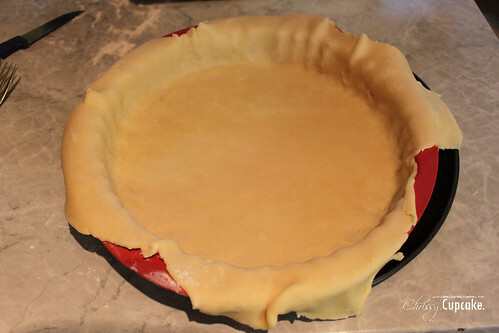 Cut away edges and squeeze the top and bottom dough with your fingers to seal the edges. Cut some nice little Steamvents in the top. 6. 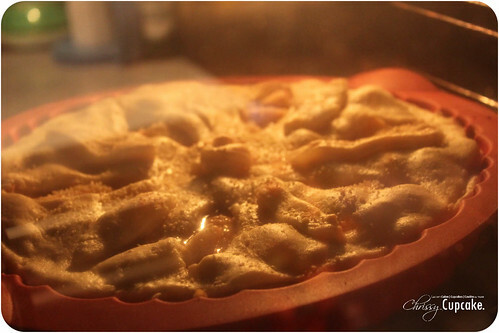 Put in the the oven for about 30 to 45min, or until the Crust is nice and goldenbrown and your apples are tender and delicious. Enjoy with a Cup of strong hot coffee and some whipped cream.